DemandGen Report recently released the results of its 2014 B2B Content Preferences Survey. The 2014 survey received responses from 105 buyers of B2B products and services. It asked survey participants about their use of content in making purchasing decisions. About 38% of the survey respondents held C-level or VP-level positions at their companies, while almost 27% held director-level positions. Content is more important than ever – Three-fourths (75%) of survey respondents said they rely on content more than they did a year ago. Desktop and laptop PC’s remain the primary tools for accessing business-related content, but mobile phones and tablets are growing in importance – Ninety-five percent (95%) of respondents said they frequently use a desktop or laptop PC to access content, while 56% said they frequently use a mobile phone, and 42% indicated that they frequently use a tablet. Buyers trust user-generated content most – Sixty-five percent (65%) of respondents said they frequently give more credence to content that includes peer reviews and user-generated feedback. Forty-three percent (43%) of respondents said they frequently trust content that is authored by a third party and sponsored by a vendor, and only 13% said they frequently give more credence to content that is created directly by a vendor. 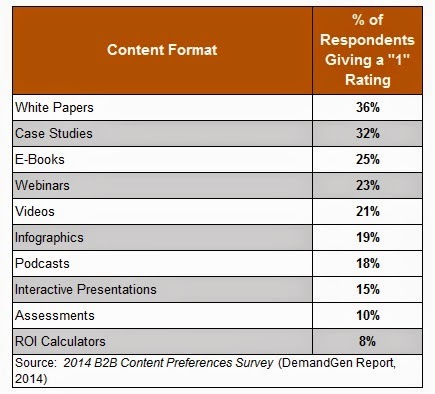 The table below shows the percentage or respondents giving each content format a “1″ rating. One important takeaway from the DemandGen survey results is that white papers authored by third-party experts are still one of the most powerful and effective types of marketing content that B2B companies can use. You can get a copy of DemandGen’s 2014 B2B Content Preferences Survey report here.